When looking for the best treatments for under eye wrinkles, it can be overwhelming because there are so many out there! We found creams, serums, masks, gels, and more – so where do you start? Don’t worry – we did all the dirty work for you and want to share our favorites with you! Before we reveal our top 10 list, here are a few things to consider before investing in a new treatment for under eye wrinkles for your beauty routine. Treatment Type: To find the best under eye treatment for wrinkles for you, we found creams, gels, serums, and masks for everyone! Use a gel or cream under makeup, a serum at night, or eye masks during your home spa routine! 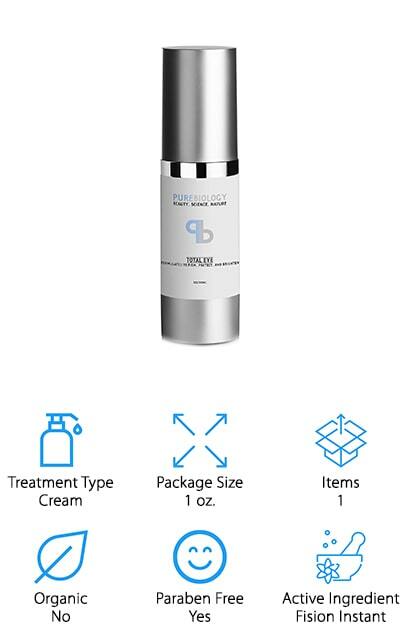 Package Size: For gels, creams, and serums, we noted the ounces for each bottle, so you can find one to suit your budget. 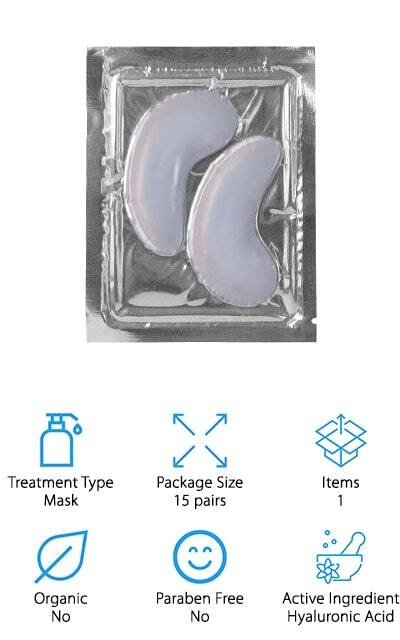 For masks, we’ll tell you how many pairs of masks each package contains to stock up your spa kit! Items: We also let you know how many packages each contains, from the number of bottles or sets of masks. This allows you to buy only what you need without breaking your budget, or you can restock when you run out! Organic: If you are looking to make the switch to more organic or natural beauty products, we found several under eye treatments that are both effective and made of organic ingredients! A great option for those looking to avoid harsh chemicals! Paraben-Free: Many people are also looking to remove parabens from their skincare routines. Parabens are synthetic preservatives that may cause hormone issues in some people. If you would prefer to avoid them, we found several paraben-free options you can use! Active Ingredient: Under eye treatments use a variety of concentrated and specialized ingredients to reduce swelling, tighten skin, and fade dark under eye circles. Some of the active ingredients in eye treatments include retinols, plant stem cells, caffeine, hyaluronic acids, and more! Now that you know what kinds of under eye treatment are out there, let’s get into the reviews! We found 10 of the best options out there, from organic creams and gels to high-potency serums and masks. No matter your budget, you can find a way to banish those pesky under eye wrinkles for good! Too busy to read all 10 right now? No worries! Start with the Top Pick and Budget Pick, and come back later for the rest! 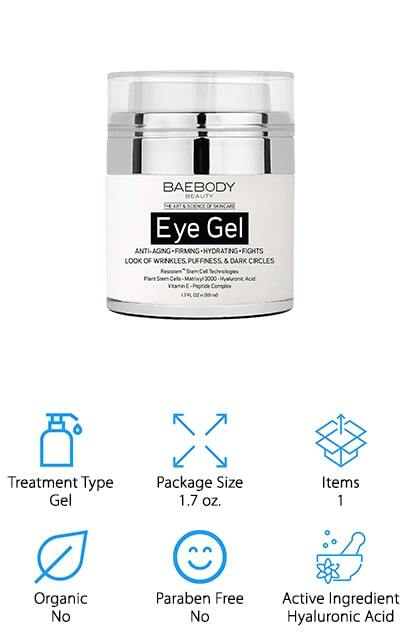 Our pick for the best treatment for under eye wrinkles goes to this gel from Baebody. This eye treatment uses hyaluronic acid, jojoba oil, vitamin E, and more to moisturize the delicate skin under the eye to prevent new wrinkles from forming. It also has powerful plant stem cells, peptides, and hyaluronic acid to plump the skin under the eye to reduce the look of wrinkles. We like that this gel comes in a package with a pump, so you’re not cross-contaminating the gel with your fingers or the open air, keeping it sanitary and safe for the eye area. You can use this gel in the morning and at night, and it works well under makeup. It also works well on other parts of your skin where you need a little extra plumping and wrinkle prevention! This is a great under eye wrinkle treatment if you need a potent product that works hard to keep your skin looking great! Sometimes the best solution for under eye wrinkles is the same thing that perks you up in the morning – caffeine! 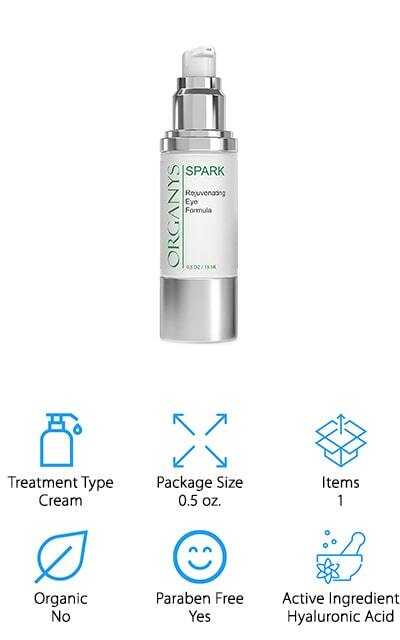 This inexpensive eye cream from Organys uses peptides, hyaluronic acid, vitamin C, and caffeine to reduce dark circles and wrinkles under the eye. Caffeine works to reduce puffiness, vitamin C brightens dark spots, and hyaluronic acid plumps the skin to reduce wrinkles and improve skin texture. It’s free of parabens, sulfates, fragrances, gluten, and more potential irritants that could cause an adverse reaction around the eye area. You can use this during the daytime or a night, and it works well under makeup or concealer. The company is also committed to reducing processing and shipping waste and sourcing their ingredients responsibly from trusted purveyors. This is not only a great eye cream – but it’s also a great company to support if you’re environmentally conscious! 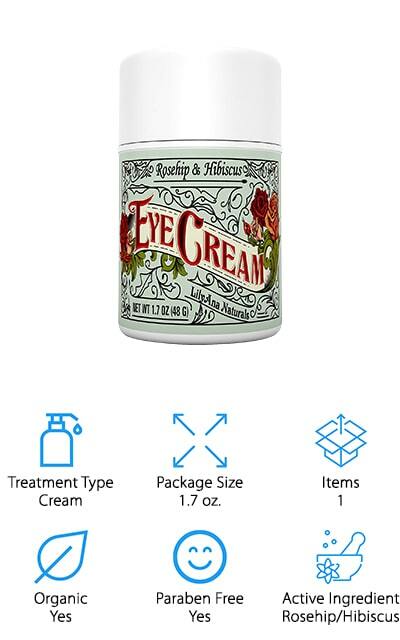 We recommend grabbing this eye cream if your eyes need a bit of a morning java boost! Finding good skincare products when you’re vegan can be challenging. Thankfully, we found this vegan-friendly eye cream that uses the power of plants to reduce under eye wrinkles! It uses plant-derived vitamins C and E, along with rosehip and hibiscus, to brighten and moisturize the eye area gently. You can also use this on the face and neck, or anywhere you want firmer, brighter skin! It’s also great for both men and women to use, and it works well under your makeup! LilyAna creates their eye cream at their USDA certified organic facility that’s also registered with the FDA. Their products are free of parabens, artificial fragrances, and colors and free of animal testing. It comes in a small pump bottle, keeping it from coming into contact with the air or bacteria on your fingers, which is essential for eye products! This is the best natural under eye wrinkle treatment for vegans who want to clean up their beauty routine! Another great natural option is this eye gel from InstaNatural, which is a natural beauty company based in Florida that’s dedicated to making effective products without all the nasty stuff you don’t want near your eyes! This gel uses mostly plant-derived ingredients like plant stem cells, amino acids, and plant extracts to reduce puffiness and fine lines around the eye. It’s great for both men and women who want to improve under eye wrinkles, you can use it day and night, and it works under makeup without getting oily or causing makeup to melt. We also like that it’s free of all those nasty things we don’t want, like parabens, preservatives, dyes, perfumes, and more! Even if you have sensitive skin, you can use this without worrying about having a bad reaction or irritation! This is another great eye treatment if you’re looking for a natural, mainly plant-based product that works well and won’t irritate even the most sensitive eyes! Next up is this potent eye cream that uses some serious ingredients to get your eyes looking plump, soft, and younger! Pure Biology’s Total Eye Cream uses Fision Instant, which is a non-GMO ingredient that reduces wrinkles by tightening and plumping the skin. It also has Baobab Tien, which is derived from the baobab tree in Africa and is known to be heavy in antioxidants and amino acids. While the Fision Instant gives you immediate results, the Baobab Tien works to prevent wrinkles and dry skin in the future by giving you healthier skin. Pure Biology also works with groups in Africa to harvest baobab responsibly, providing much-needed jobs to the economy in underdeveloped areas. It also uses 90% natural ingredients and is free of perfumes, dyes, parabens, and more potential irritants. You can feel good knowing this under eye treatment will work to reduce under eye wrinkles, and you’re doing something good for others at the same time! Another potent ingredient in the fight to eliminate wrinkles is retinol, and this eye cream from RoC is a popular drugstore favorite that uses retinol to keep eyes looking their best! It doesn’t just help to eliminate wrinkles, either – it also helps with dark circles, puffiness, and dullness around the eye area! While we often consider retinols to be prescription-grade or overly potent for the delicate eye area, don’t worry! RoCs’ Retinol Correxion Eye Cream is formulated to melt into the skin, so it won’t travel into the eyes, preventing irritation. We like that this eye cream continues to have lasting effects, even if you continue using it long after your eyes are looking better. It works well under makeup, but make sure to use sunscreen whenever using retinols, as they are photosensitive and can cause sunburns or sunspots! This eye cream is seriously potent, yet inexpensive – everything you want when you need to see results without breaking the bank! Next up is yet another type of treatment for under eye wrinkles – masks! These collagen eye masks from LA PURE are gel pads you place under your eyes that contain potent ingredients to improve your eye area. They use plant-based collagen and hyaluronic acid to help firm and smooth the skin around your eyes to reduce wrinkles. It also has grape seed extract and rose seed extract. They’re also easy to use – just stick them to your under eye area, and leave them for 20-30 minutes before removing and continuing your skincare routine! Each package comes with 15 pairs of masks, so you’ll be stocked up for a while without paying a ton! We also think these would be great to keep in the refrigerator, so you can use them to cool and soothe puffy eyes in the morning, after a long flight, or after crying at the end of a sad movie! If you’re looking for the best eye cream to tackle wrinkles, and dark circles all at once, this luxurious eye cream from AsaVea might be your best bet! 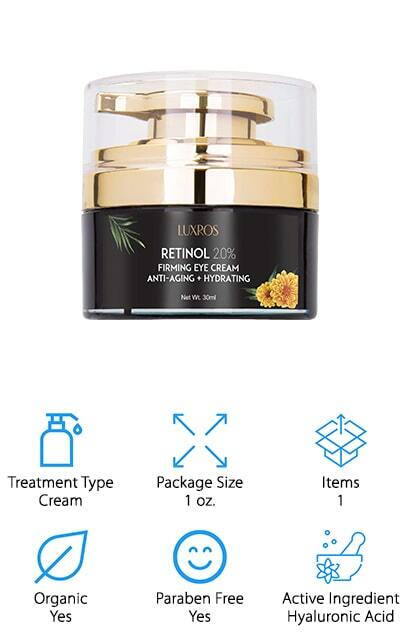 This cream contains 2% retinol, which is meant to brighten the skin and improve texture over time. 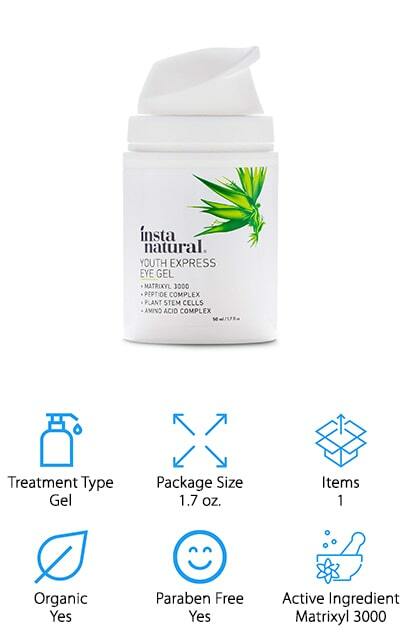 It also has hyaluronic acid, a potent moisturizer that helps to plump the skin without looking puffy. There’s also Matrixyl 3000, which firms up the skin to prevent new wrinkles from forming. Since it’s made of 75% natural ingredients, you can feel good about using it so close to your delicate eyes – even if you have mildly sensitive skin! There are no parabens, fragrances, or artificial dyes that could cause an allergic reaction or irritation. We also like that it comes in a luxurious container with a shiny gold pump to keep out bacteria and prevent cross-contamination. 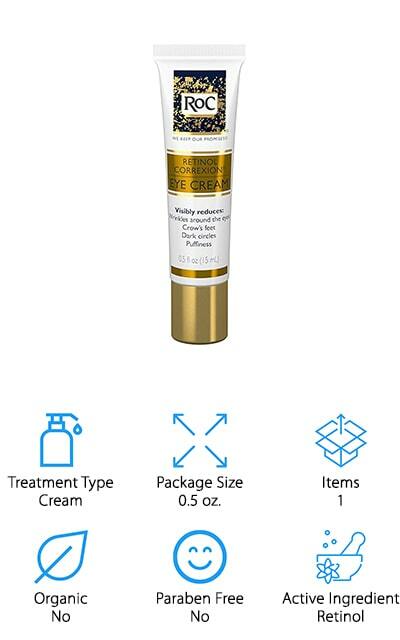 This is a great eye cream if you need a product that tackles multiple problems in one cream! When searching for the best oil for under eye wrinkles, we came across this all-natural serum from Leven that will leave your eyes looking fresh and bright! 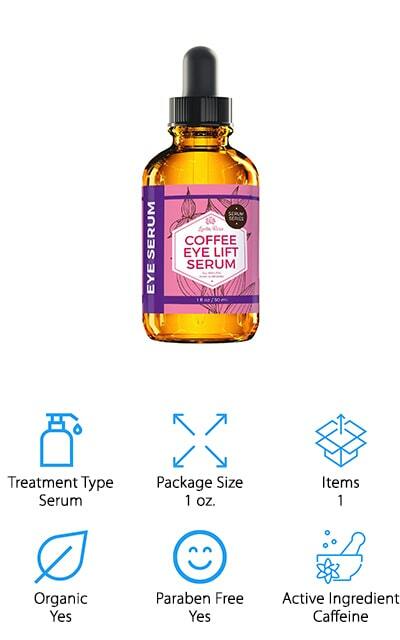 This serum uses caffeine to help stimulate blood flow to the eye area, which brightens them up without the use of harsh chemicals. Caffeine also encourages the production of collagen around the eyes, which reduces the look of wrinkles and plumps skin without irritation. It also has rosehip oil, which is rich in vitamins C and E, along with omega-3 and omega-6 fatty acids. Rosehip oil is a powerful antioxidant, brightening agent, and helps repair damaged, dry, and thin skin. If you’re concerned about what you put on your skin, this is a great serum to invest in because it only has 6 ingredients – all of which are organic oils. If you want a simple, highly effective, serum that will brighten and tighten your eye area, definitely add this to your beauty routine! The final eye product we wanted to review is this luxurious under eye mask from SWISSÖKOLAB. 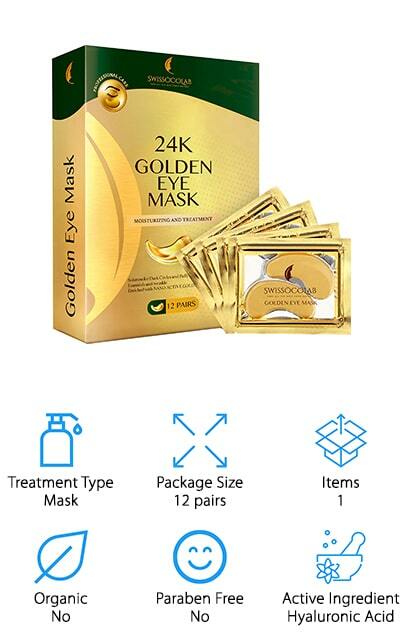 It uses the power of gold to gently treat the eye area and keep you looking beautiful after each use. The nano-active gold acts as a powerful antioxidant and anti-inflammatory to remove toxins and take down swelling. They also have plant collagen and hyaluronic acid, both of which work to moisturize and plump the skin around the eye to reduce the look of wrinkles and fine lines. We also like the addition of vitamin C, which helps brighten the skin around the eye to make it seem more youthful and vibrant. They’re also incredibly easy to use! They stick to the under eye area very well, so all you have to do is put them on and do whatever you want for 15 minutes. Once your time’s up, remove the pads, work in the excess serum, or rinse with warm water before applying makeup!